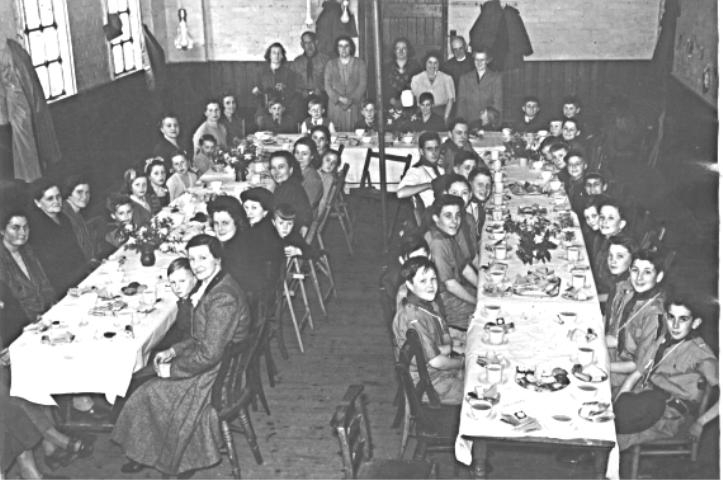 This picture shows a 1st Stock Scout Group party held in the Rectory Hall in 1950. However, at the back are Mrs Elliot, Skipper George Padwick, Mrs Tunbridge, Mrs Owers (I think), Mrs Watson and the Congegational Minister and his wife. Immediately in front of Mrs Watson is Colin Porter. The line of Scouts facing right from rear are : John Watson, Jim Sargant, Barry Elliott, Bill Hewitt, Roy Watson, Laurie Tunbridge, ?, & George Owers. Facing left from front are : John Addison, Michael Clark, Jim Reynolds, Paul Coupe - and then I'm lost. Mums I can identify are - far left from front) : Mrs Smith (Robin was one the Cubs), Mrs Stammers (Bill Hewitt lived with her as an evacuee), Mrs Baldwin. Facing left from front : Mrs Clark, Mrs Curtis, ?, then Mrs Coupe. It would be interesting if some more faces could be identified. How about a special challenge on the site?